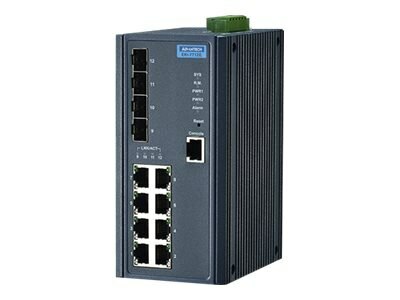 EKI-7712E-4F/4FI supports 8 Fast Ethernet ports and 4 SFP (mini-GBIC) ports. It can provide users abundant ports to connect many devices. Besides, it is embedded with Advantech IXM function, this can benefit users for fast deployment and can dramatically save engineers time and costs. The EKI-7712E series also supports NMS to help IT managers with networking maintenance and failure prevention. Finally, the EKI-7712E series is equipped with X-Ring Pro which can achieve ultra high speed recovery time of less than 20 ms to ensure network stability. The switch also features a wide -40° to 75°C operating temperature(EKI-7712G-4FI) and NEMA TS2 rating, making the switch an ideal solution for use in traffic application and have successfully passed the EN50121-4 European railway standard requirements of emission and immunity for railway platforms and trackside deployment.